Be the first to share your favorite memory, photo or story of Truman. This memorial page is dedicated for family, friends and future generations to celebrate the life of their loved one. Truman Boggs passed peacefully from this world on November 11, 2018. Services will be held at Gunsight Baptist Church on Thursday, November 15 at 10am. It will be followed by private gravesite service at Caddo Cemetery. Visitation will be Wednesday night, November 14, from 5-7 pm. Services are entrusted to Melton-Kitchens Funeral Home. He was born November 19, 1933 to Harvey and Minnie Joe Boggs in Pickettville, TX. He was preceded in death by his parents, two sisters, Joyce Marie Blackman and Christine Jones, and the love of his life, Louise Boggs. Truman was an adventurous soul and hitchhiked to California in his late teens. After working all summer, he bought a convertible and drove it back to Texas. He held many jobs in those early years as taxi driver and was paid to dance with women at various clubs. He and Louise started Boggs Dirt Work in the ‘70s and later Truman Drive Thru in the early 90s. Upon retirement, he and Louise traveled the country with their RV. Us kids never knew where they would end up or when they would appear on our doorstep. They loved to dance and could be found at the Elks Lodge,or which Truman was a member, and even Ft. Worth or Abilene scootin’ their boots. Truman never met a stranger and was blessed with many friends. He and Louise were members of the Gunsight Baptist Church and then he moved his membership to the Crystal Falls Baptist Church. Truman is survived and loved by his best friend, sister, and constant companion, Peggy Ballard; a daughter, Jacque Lawson of Breckenridge; daughter Vicky Lyons and husband Dale of Breckenridge; daughter Gayla Timmerman and husband Losey of Lubbock; and son Gary Boggs and wife Mickey of Breckenridge. 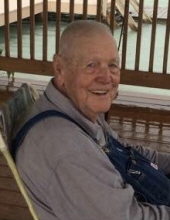 He is blessed by the love of 6 grandchildren, 20 great-grandchildren, and 7 great great-grandchildren. In lieu of flowers, you can make memorials to Breckenridge Senior Citizens or Crystal Falls Baptist Church. Rex Boggs and Danny Lee Officiating. **Interment services are Immediate family only. Donation's can be left at Funeral Home office. "Email Address" would like to share the life celebration of Truman Gaylord Boggs. Click on the "link" to go to share a favorite memory or leave a condolence message for the family.